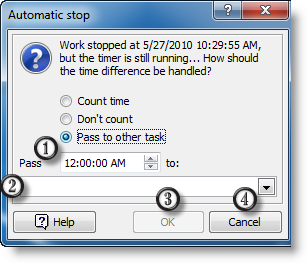 When AllNetic Working Time Tracker detects that user has stopped his work, it will propose to stop time tracking. 1. Continue time tracking but don't count the time of absence. 2. Stop time tracking and don't count the time of absence. 3. Continue time tracking but count the time of absence as another task. 1. 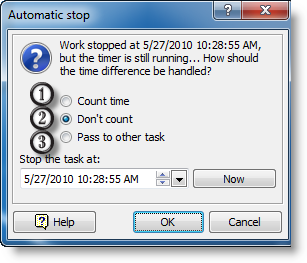 The time when work was stopped (automatically set to the time when activity stop was detected). 2. Set current time as the tracking stop time. 3. Click OK to stop time tracking at the specified time. 4. Click Cancel to abandon time tracking stop. This is the default mode. Click OK to stop time tracking at the time the activity stop was detected, or click Cancel to continue tracking. 1. Time that will be excluded from the tracked time. 2. 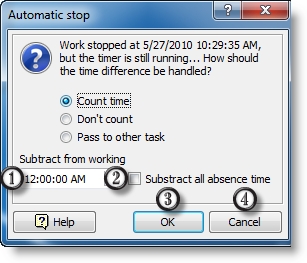 Set this checkbox on if you want to exclude total absence time. 3. Click OK to continue time tracking excluding the specified time. 4. Click Cancel to abandon. This mode is suitable when you don't need to count your absence time, e. g. your coffee break. 1. Time that will be passed to another task. 2. Here you select the task to which the time will be passed. 3. 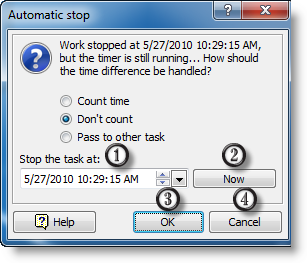 Click OK to continue time tracking of the current task after passing the specified time to the selected task. This mode is much like previous one except the time of absence will not be abandoned but passed to another task. For example, this way you can count how much time you spend for coffee breaks.